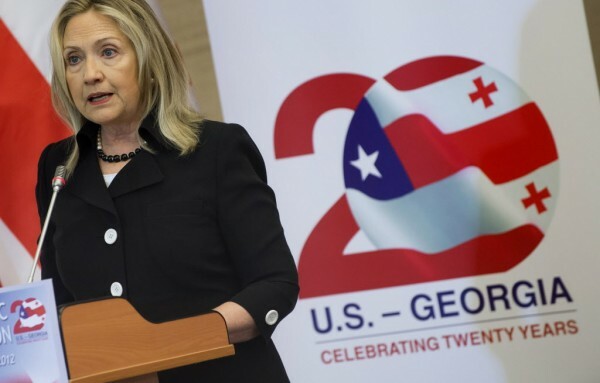 US Secretary of State Hillary Rodham Clinton addresses the US-Georgia Strategic Partnership Commission in Batumi, Georgia Tuesday June 5. Those close to Hillary Rodham Clinton are starting to openly speculate that the secretary of state will run for president again in 2016. The growing crew of speculators now includes three big ones: House Minority Leader Nancy Pelosi (D-Calif.), former Pennsylvania governor Edward G. Rendell and former president Bill Clinton himself. The question is whether this amounts to wishful thinking on behalf of Clinton backers still unsatisfied by (or bitter about) 2008, or an indication that she is actually considering another try. Clinton herself has shunned talk of another bid. She has said she will not serve another term as secretary of state if President Obama is reelected and suggested that the first female president won’t be her. Pelosi and Rendell have been strongest in their advocacy. Both said in reports this weekend that they expect that Clinton to dust off her campaign for another go at it four years from now. Clinton will turn 69 just days before Election Day. Regardless of Hillary Clinton’s own deliberations, the fact that three such high-profile people seem to want her to run for president four years from now is significant. After all, if everybody around you is pressuring you to do something, it becomes much harder to resist. And another presidential campaign makes a lot of sense for Clinton. She’s basically the most popular female public figure in the country, with about two-thirds of Americans viewing her favorably. And she’s got the kind of résumé most presidential candidates would kill for, as a former first lady, senator from New York and successful secretary of state.